Our very busy travel schedule coupled with each of us still having full time jobs (I know, right? I don’t know how we squeeze all this travel in either!) doesn’t allow us any time to squeeze in a trip to the 2012 Olympic Games in London this summer. But our fourth and final port of call on our cruise to Greece was Katakolon, the gateway to Olympia. Of course we just had to see where the Olympics themselves were born! The Olympic Games were held every four years dating back to 776 BC. 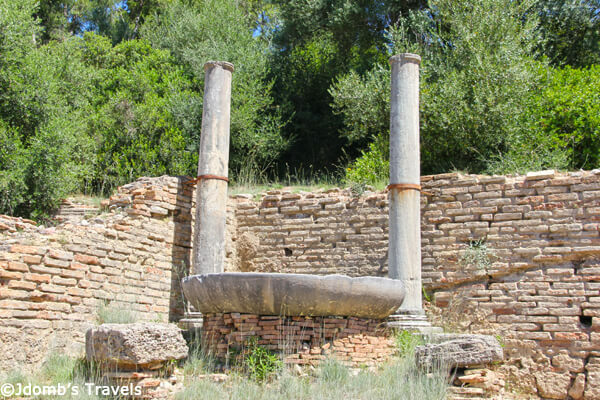 This ancient site still plays an important role in the Olympic games today. 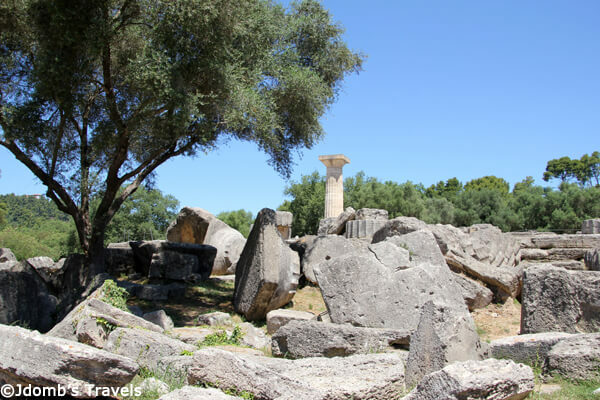 The very 2012 Olympic torch currently making its way to London, where it will finally arrive on July 27, was lit and began its journey at the Temple of Hera ruins on May 10th. From the Temple of Hera, we made our way through a stone passageway to the stadium, where the games dedicated to the god Zeus were held in ancient times. The track is 697 feet long and despite the sweltering temperatures, a tour guide with a small group stood at the exedra, a stone platform where the judges sat. Microphone in hand, he announced that Mike would be running a lap. Even though we weren’t part of this tour group, we cheered Mike on as he took off sprinting down the dirt track, dust clouds kicking up and whirling around him from the slight wind. We continued to spur him on as he got smaller and smaller as he neared the other side of the stadium. When Mike made it back to complete his lap, he didn’t get a gold medal, but the tour guide was ready to reward him with a plastic silver crown. Mike proudly accepted, it glinting in the sun as the crowd that had gathered gave him a round of applause. We wandered the rest of the archeological site admiring the beautiful ruins. We’re never any less impressed with the sheer size and intricate detail when we visit ruins. We think it is just incredible such spectacular buildings were constructed 2000 years ago. Returning to Katakolon, we hired a taxi to take us to the beach since we hadn’t actually made it to a beach in Santorini or Mykonos. We simply asked the driver to recommend a local beach and we were not disappointed! He took us to a small beach called Agios Andreas Beach. There is a restaurant/bar literally right on the beach called Liris that serves us the most delicious mixed dishes. We shared a mixed plate with everything from Greek potato salad to steamed mussels to grilled octopus to roasted vegetables. We ordered a side of delicious tzatziki to spread over the warm bread. The portion was more than plenty for the two of us and even with a beer and orange ouzo smoothie, our bill was less than €20! 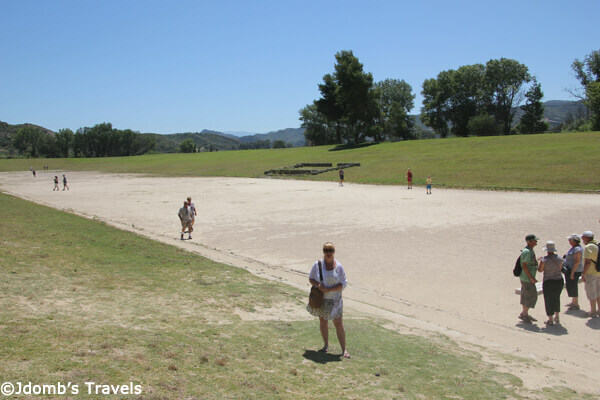 Ancient Olympia is 35km from the port. We took the GeoTravel bus located in the port area to Olympia. It is €10 per person round trip and you have time to visit both the archeological site and museum, as well as shopping in modern Olympia. Back at the port, we hired the taxi for €20 round trip to the beach. The driver dropped us off and asked what time we would like to be picked back up; payment was not required until we the return trip. Norwegian offered an Olympia and Beach Resort shore excursion for $119.99 per person. Total savings = $190. Very nice article. I will keep this one for m childrens’ series when the character Nicholaas goes to Greece. I really wish I had gone here when I was in Greece, looks really cool. If I ever make it back to mainland Greece (because I *know* I’ll go back to the islands!) I might have to make this a priority. Hi Ali! It was really interesting to visit the ruins and such a historical place that influenced our modern times! And I agree – we will definitely be back to the islands. We also have yet to visit Athens. You have such an amazing way with words Jennifer and these photos are incredible. I am from Greece (Athens) and I visited Olympia when I was a kid (elementary school). My favorite place was the temple of Hera and the Amphitheater. I visited the place once again when I was 15 years old but that was really it and to be honest now that I don’t live in Greece anymore I regret not visiting the temples more often. Thanks for sharing, Endri! We’re quite excited to head back to Greece next month to explore a bit more.